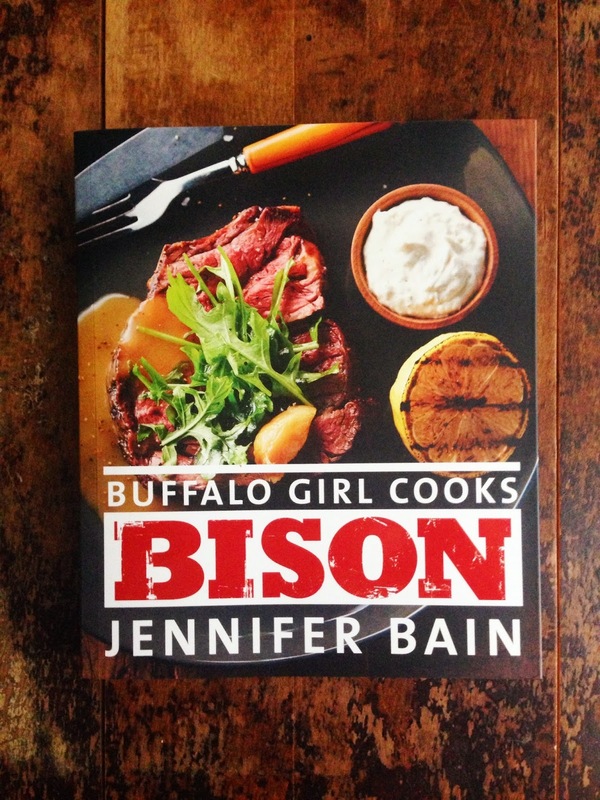 Buffalo Girl Cooks Bison is bursting with loads of great info about bison. Nutritionally, it's a powerhouse. Lean, with less fat and fewer calories than other red meat, plus more protein and iron. It's also super high in Omega 3 essential fatty acids. Because there is virtually no marbling in the meat, bison cooks faster than beef, thus you have to be a bit gentler when cooking, and Bain strongly suggests the use of a meat thermometer to make sure there is no overcooking. There are 106 bison recipes and 23 sides, and all recipes are so well written, it's like she's in your kitchen guiding you along. Chapters are divided into the cuts of meat, such as Ground (Burgers and Balls); Ground (Beyond Burgers and Balls); Steaks; Roasts; Ribs/Shanks; Sausages; and Odd Bits. There's everything from meatballs and chili, to carpaccio and curry, to bourguignon and beer-braised ribs. Photographs are lovely, and I quite enjoyed reading about how the bison meat travels from field to corral, slaughter to freezer, finally ending up on the stove and into our stomachs. Bain recommends going to canadianbison.ca to look up where to buy bison in your area. In the U.S, to to bisoncentral.com for their Where to Buy page. Once you buy your bison, I highly recommend you buy Bain's book. There are so many more recipes I want to try - like Smoky Bison Cabbage Roll Casserole, for starters. I'll let you know how it goes. I got my hands on a small roast, and I knew I wanted to make a stew from the book. Something hearty for these cold winter days ahead. There's nothing better than a good, slow braise in the oven. 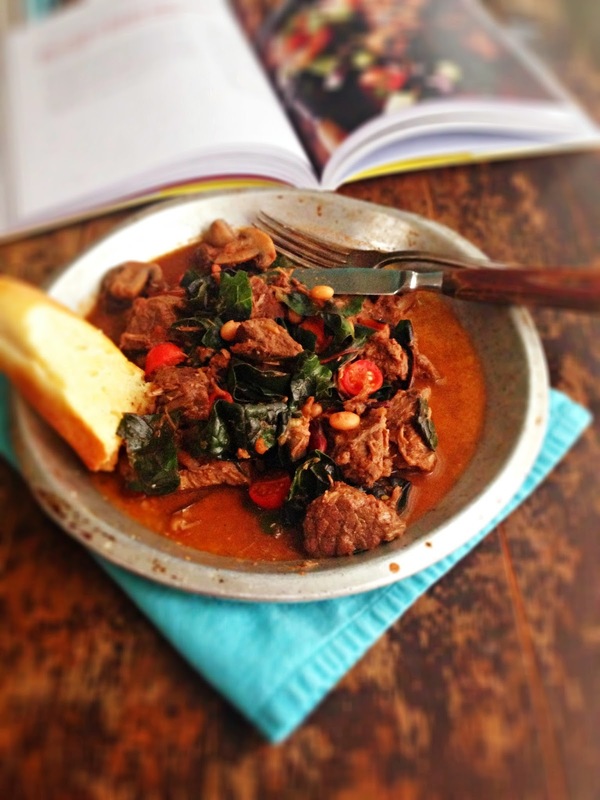 The combination of beans and bison is a winner, and note the use of white wine - it complements the richness of the stewed bison without overpowering the natural flavours of the meat. You can use 2 1/2 cups of canned beans instead of the dried beans, if you wish, but I like soaking my own. The stew was rich and earthy; the bison meat fell apart into tender morsels and the beans soaked up all of the flavours, too. I liked the addition of chard at the end, to add colour as well as nutrition. Served with chunks of hot buttered garlic toast, it was comfort food at its best. 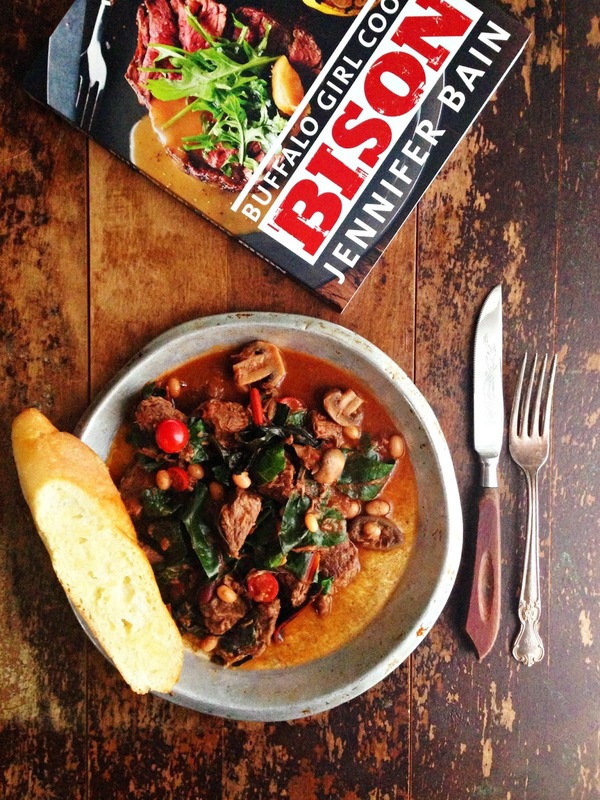 Disclosure: I was sent a copy of Buffalo Girl Cooks Bison for review. All opinions are my own. Soak the beans overnight in a medium bowl filled with cold water. Drain and rinse. In a large ovenproof pot over medium high, heat 2 tbsp of the canola oil until just about smoking. Carefully add bison in a single layer and brown for about 3-4 minutes. You may have to do this in batches. Transfer meat to a plate. Add remaining oil and add the onions and garlic to the pot. Cook, stirring for 7 minutes. Add mushrooms and wine, raise heat to high and boil for 3 minutes. Return bison and its juices to pot along with tomatoes and their juices, beans, stock, thyme, salt and pepper. Cover pot and transfer to oven. Cook, stirring occasionally, until bison and beans are tender, about 2 1/2 hours. Stir in chard and cover. Let stand for about 5 minutes before serving. Serves 6. 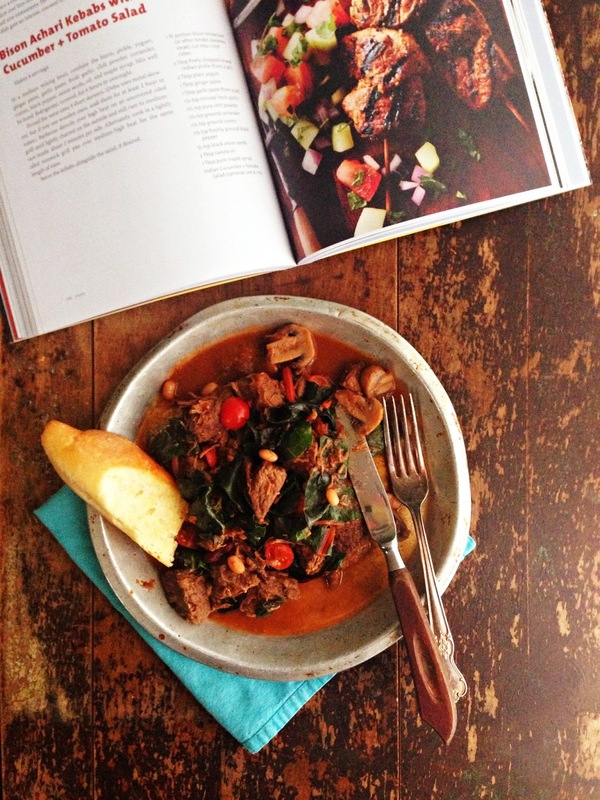 Recipe from Buffalo Girl Cooks Bison, by Jennifer Bain. I don't see Bison much around here, which could be a small-town thing or maybe it's an Ontario thing. I'd love to try cooking it though, and if I ever get my hands on some, this is what I'll be trying. Beautiful! OOF! I must get that cookbook, I MUST! I love bison, as well...and all sorts of wild game..I'll pretty much eat any type of meat, but the more wild, the better. This stew looks magnificent for fall/winter! Jennifer - Good luck with your bison quest! I'm sure you'll find some in your neck of the woods. Julia - It's such a good book. I want to make everything! 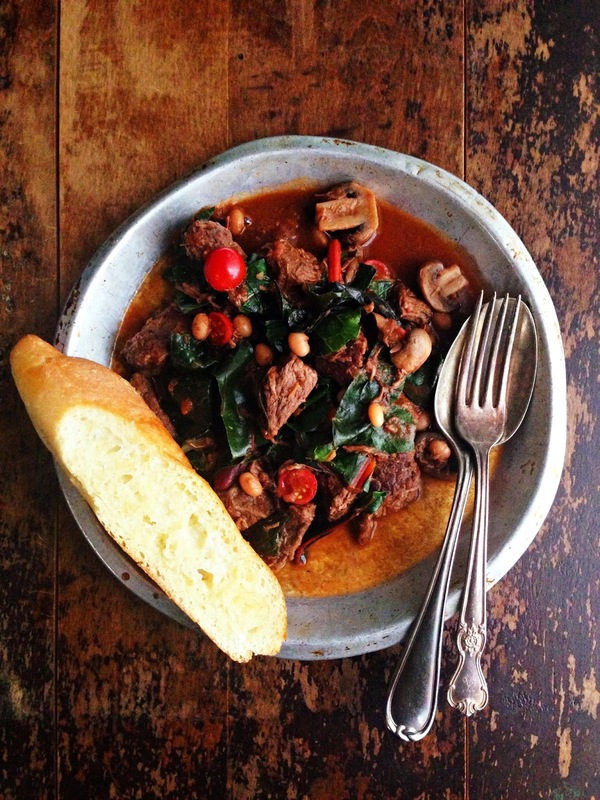 This stew is so good for cold weather.